I knew the weather could not stay that mild for long... Now we're going to have to play by the rules of Mr Winter! According to the forecasts, the cold is going to fall over Paris this week with temperatures between minus 1 and minus 6 (on Thursday). Minus 11 is even expected for next Saturday. I think you're going to see some Metro photos pretty soon because I don't think I'l bear riding my scooter with temperatures like that! About this photo: don't get too excited, this is fake snow! 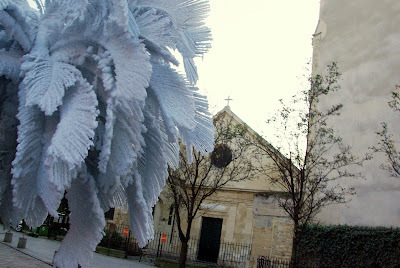 I took it in the 5th arrondissement, rue Galande and the church behind the palm tree is Saint Julien Le Pauvre. Hey, I knew that was fake snow!! What a beautiful shot, Eric. By all means, stay off your scooter in such weather and keep your little tootsie warm. Make that tootsies, plural—of course, I want you to keep all your fingers and toes toasty. Hey, I live in PHX by way of MIA, and at first glance, I thought it was real snow! What do I know, Alexa from NYC. That snow might be fake, but by what you're telling us, there will be some real snow pretty soon! I'd love to see some metro photos though.... maybe thursday?! Minus 11? That's gotta be some kind of record, even for Paris, no? Didn't realize it ever could get that cold in Paris. It's a great time to get your fireplaces blazing. Like Monica, I too will look forward to the Metro shots. Any snow accomanying the cold weather in the forecast? I can feel the cold coming already and like a bird, will be heading south soon. Fake snow is fine with me! But I do hope you stay warm, Eric, and by all means, pics of the Metro would be lovely! Bundle up! I'm sure we'll be happy with the Metro pics. I wouldn't wish that kind of cold on anyone. @Thib didn't know that. Actually it's hard to catch on with what's on strike in Paris, seen that so often there is some kind of service on strike! Last week we received 17+ inches of snow....so if it snows in Paris, Eric...PLEASE, please, please, I'd love to see a photo of a snowy Eiffel Tower! ;) Thank You! Oh, okay. And I thought I'd just seen my first-ever white palm tree! Thanks Jeff...this could be something PHX-CDG could sing on her flights too I think! Jeff, your Xmas ditty is so apt for my wife who is flying up to Scotland this Friday to see her mum and is returning on 23rd Dec. She is conviced that snow or fog or something will delay her flight back. I visited Paris for 2 weeks in November 1969. Yes, a long time ago. I remember the damp cold. No snow. Never be a tourist in the winter. A little sunshine in the rain?